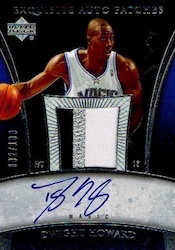 2005-06 Upper Deck Exquisite Collection Basketball is kind of like the forgotten cousin of the brand's run on the hardcourt. With just one rookie card that truly stands out, it's certainly more overlooked than those with stronger rookie crops. That said, it's still an Exquisite set. Ample high-end autograph and memorabilia options still exist for collectors. The 2005-06 Upper Deck Exquisite Collection Basketball set has 42 base cards, 39 autographed patch rookie cards and 13 autographed rookies. All are numbered to 225 except six of the autographed patch rookies. Like other Exquisite sets, the base cards hold solid value as player collectors, team collectors and set builders all vie for the few that are out there. No fault to Upper Deck, but 2005-06 wasn't a stellar year for rookies. 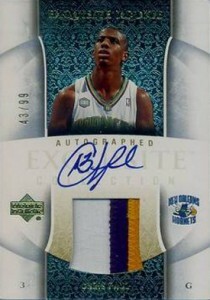 2005-06 Upper Deck Exquisite Collection Basketball has just one rookie that has truly classic appeal. That card belongs to Chris Paul. Numbered to 99, it has both an on-card autograph and a patch swatch. 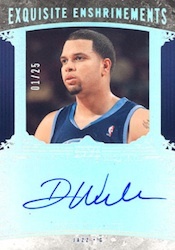 Other standouts in the set include Deron Williams, Andrew Bynum and Monta Ellis. While the rookie crop is weak, it's only one part of Exquisite. There's still the autograph and memorabilia lineup. Exquisite hits are tough to match, often combing on-card autographs, compelling patch pieces and low print runs. 2005-06 Upper Deck Exquisite maintains this high standard with sets like Dual Logoman Autos, Emblems of Endorsement, Exquisite Enshrinements and Limited Logos. Michael Jordan, LeBron James, Kareem Abdul-Jabbar, Kobe Bryant and Larry Bird are among the players with high-end hits in the set. 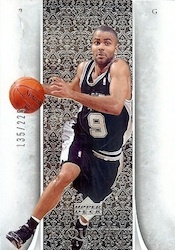 2005-06 Upper Deck Exquisite Collection Basketball boxes come with one pack of five cards.